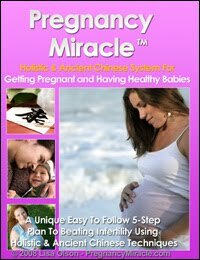 I bought the book Pregnancy Miracle in Aug of 2007, after 3 failed attempts at IVF [in vitro fertilization]. While I have conceived naturally in 2005, I unfortunately miscarried. After 3 months of treatment using your step by step natural approach to infertility, I got pregnant with my little girl. I do believe that this unique program and techniques are nothing short of revolutionary as it helped us to have our daughter at age 43 and a half. I followed the book's recommendations before and throughout my pregnancy and still do today. This guide gave me a whole different perspective on infertility, even for a bitter skeptic woman who had three failed IVF attempts. Thank you, Lisa for all that you have done for me.